When closing the cover, make sure that it is lying correctly on the fuse box. Moisture seeping in or dirt could otherwise impair the operation of the fuses or the cover could be damaged by the rear bench seat. Fold the left-hand rear bench seat forward . ■ To open: reach into recesses 2 on each side of fuse box cover 1. 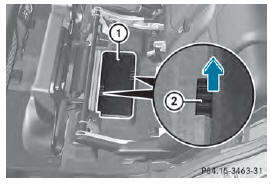 ■ Fold cover 1 up in the direction of the arrow and remove it from the fuse box. The fuse allocation chart is located in a recess at the side of the fuse box. ■ To close: place cover 1 on the fuse box. ■ Press cover 1 down until you feel the clamps engage. ■ Fold back the left-hand rear bench seat .